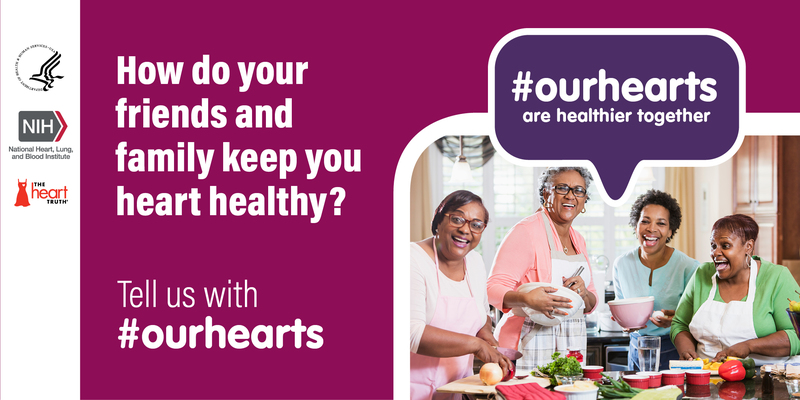 Share these Facebook and Twitter resources to encourage people to be heart healthy together. To use these images, right click on each one and select "Save Image as..." or click on the download button to save them on your device. 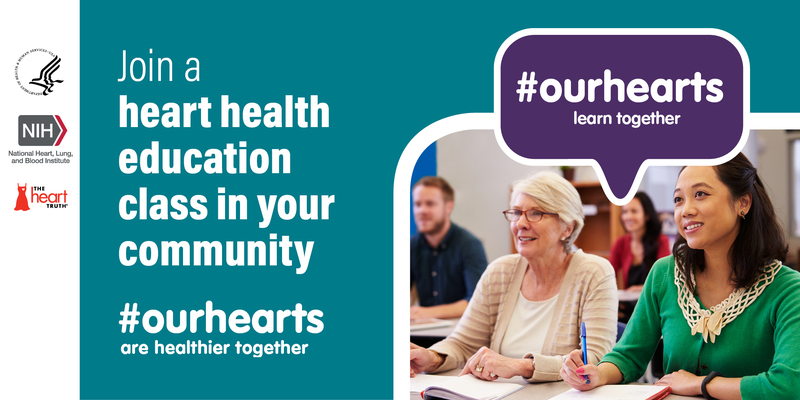 Find sample social media posts below. Copy and paste into your feed. 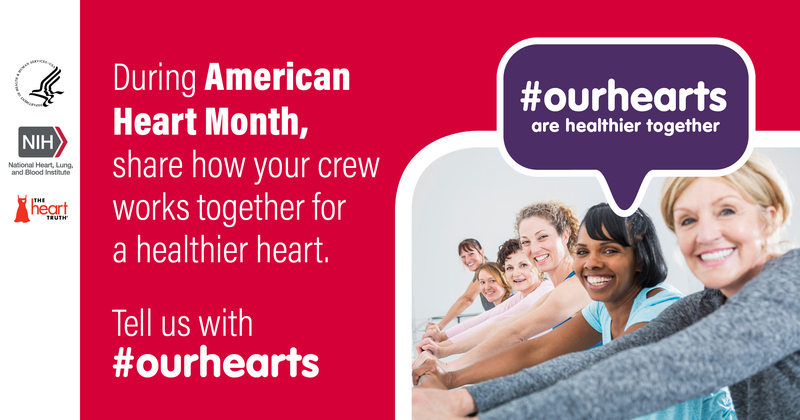 These posts can be added to your calendar in advance of and during American Hearth Month 2019, to show support and raise greater awareness of the benefits of teaming up to foster heart healthy habits. 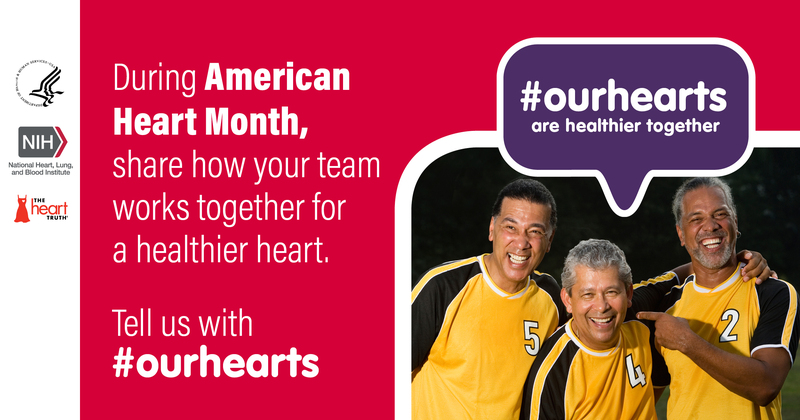 Preventing #heartdisease is important and you don’t have to go it alone. . That’s why we’re joining with the National Heart, Lung, and Blood Institute and The Heart Truth® during American Heart Month to help spread the word that #OurHearts are stronger when we work together. 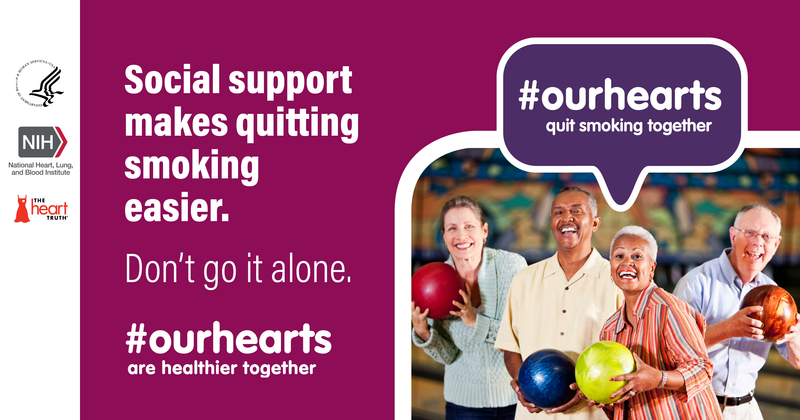 Research has shown that having social support and personal networks makes getting regular physical activity, eating healthy, losing weight, and quitting smoking easier. 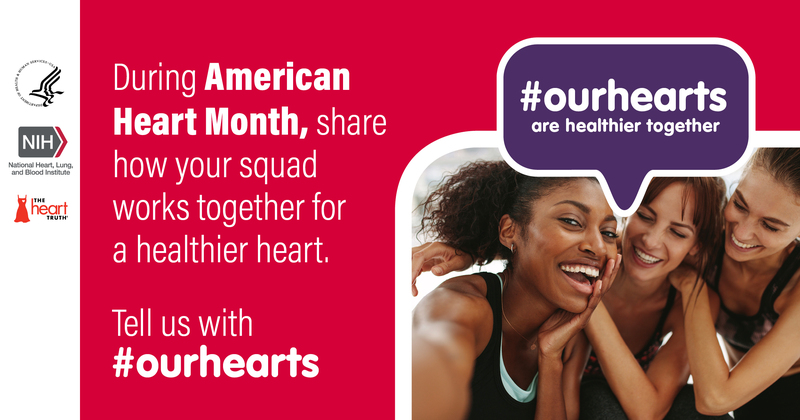 During American Heart Month, assemble your squad and use #OurHearts to share how you’re working together to be heart healthy. 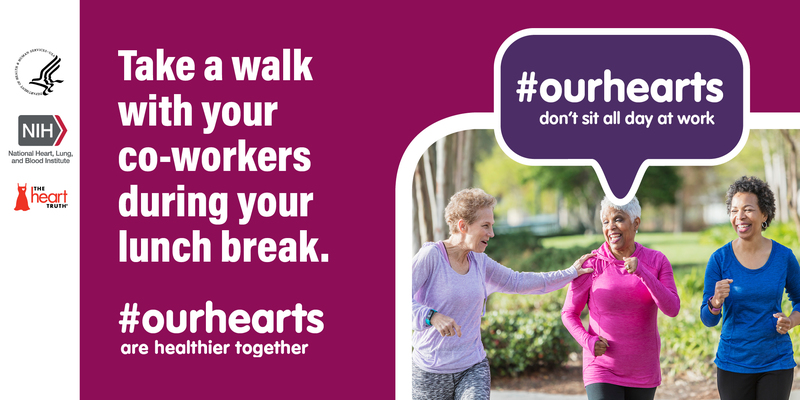 Whether at work, at home, in your community, or online, Our Hearts celebrates the power and strength of acting together. 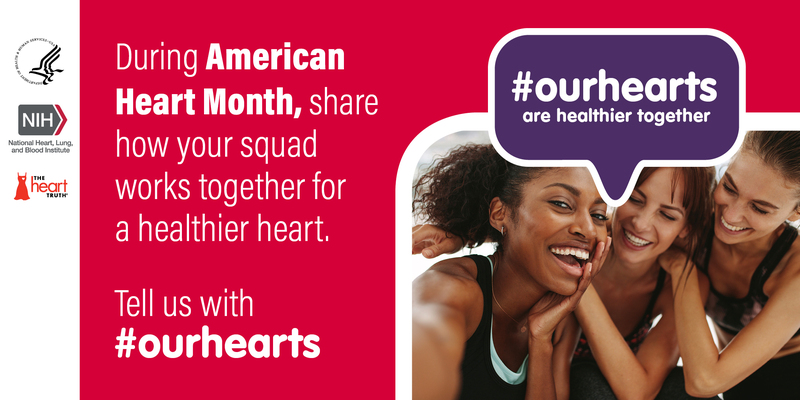 During American Heart Month, use #OurHearts on social media to show the world how you and your squad are committed to supporting each other to be heart healthy. 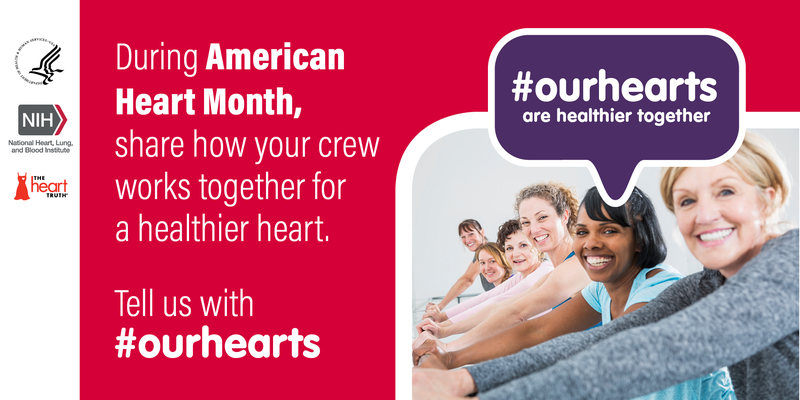 For American Heart Month, we’re joining the National Heart, Lung, and Blood Institute and The Heart Truth® to spread the word that reducing the risks of heart disease is more achievable when you’re part of a team. 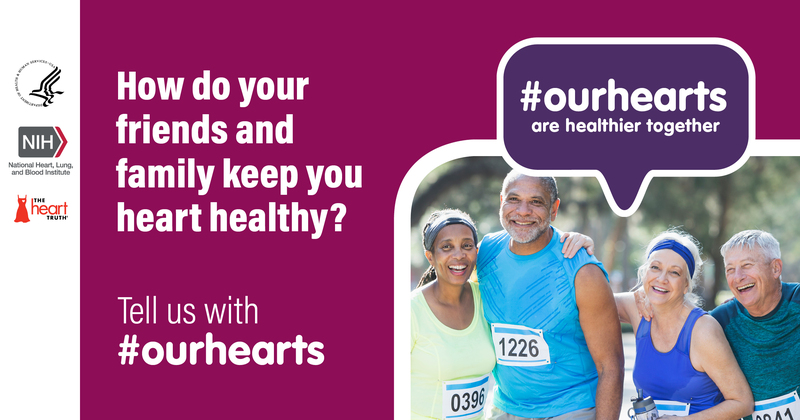 #OurHearts are healthier together. 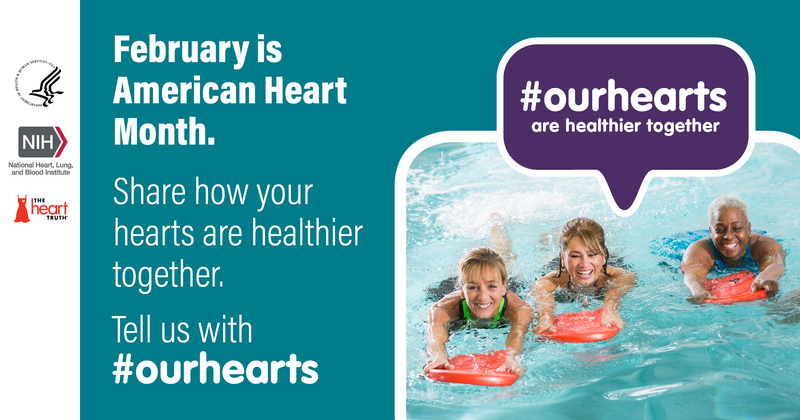 Visit www.nhlbi.nih.gov/heartmonth for more information and to see what others in your community are doing. 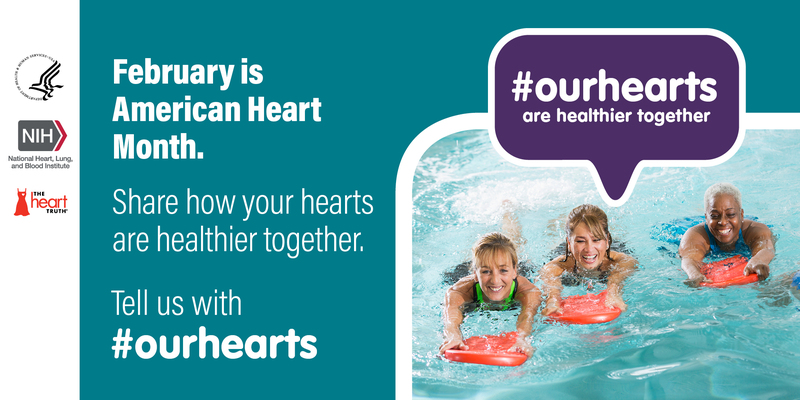 Let’s encourage and motivate each other to be heart healthy! 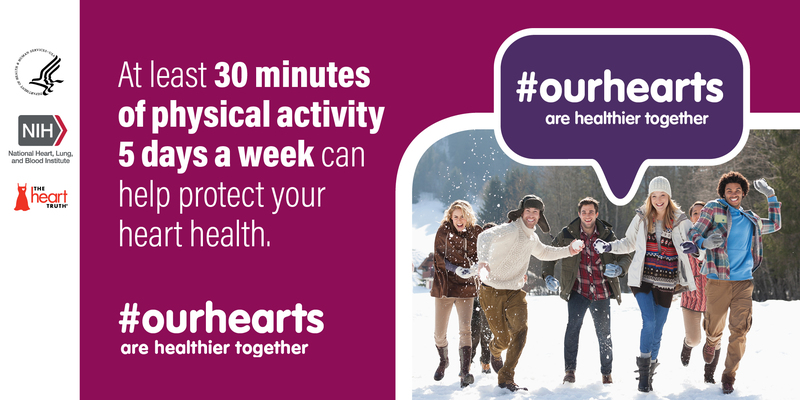 At work, it’s easy to fall into sedentary habits. 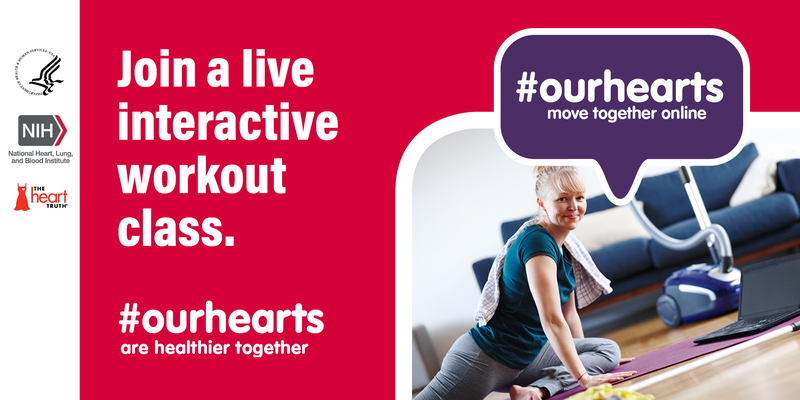 Make sure to move more throughout the day. 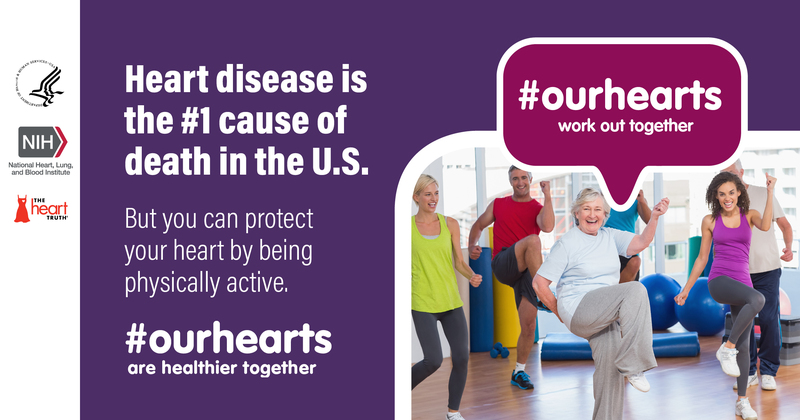 Take the stairs. Park farther away. 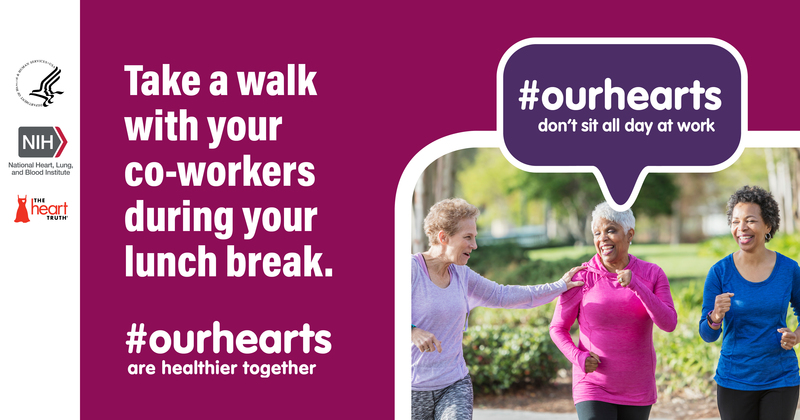 Get up from your seat and visit your coworker instead of e-mailing. 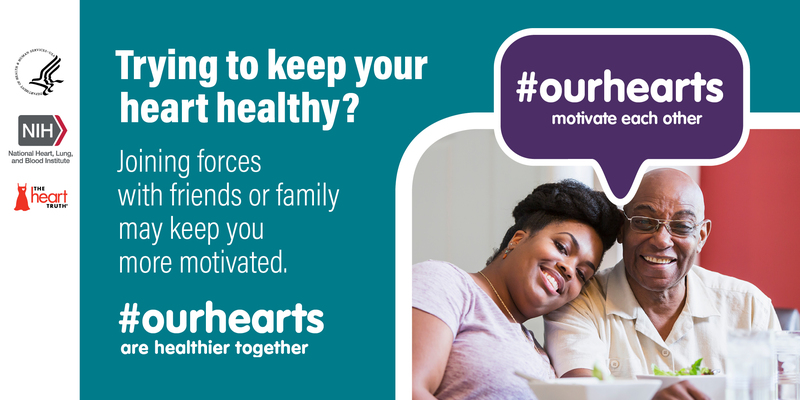 How do you and your coworkers find ways to be heart healthy? 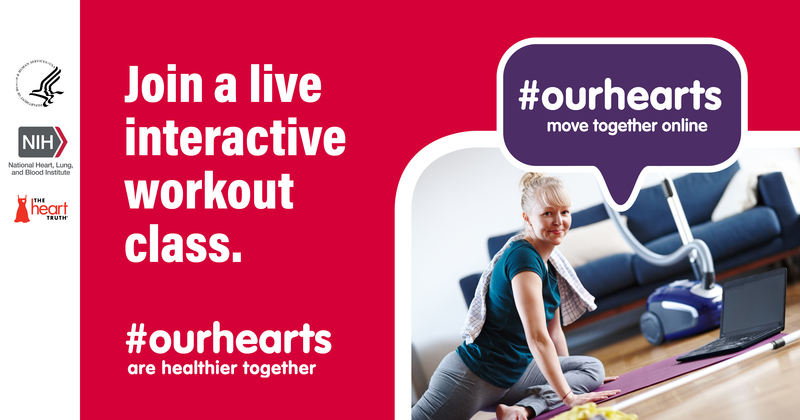 Give us your tips using #OurHearts on social media. Home is where the heart is. 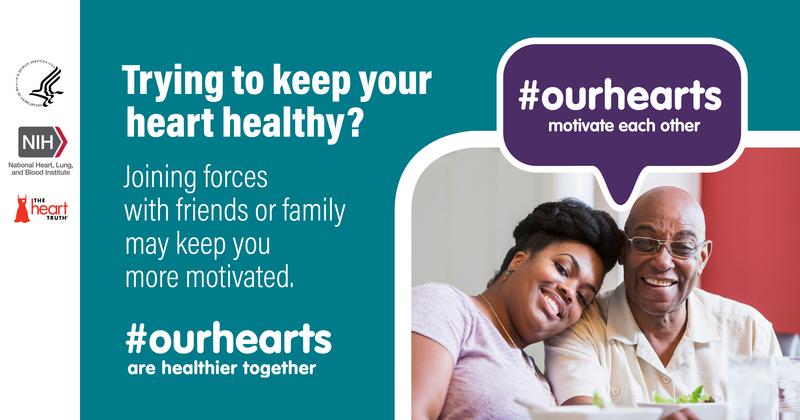 Many studies have shown that having positive, close relationships and feeling connected to others benefits our overall health, our blood pressure, weight, and more. 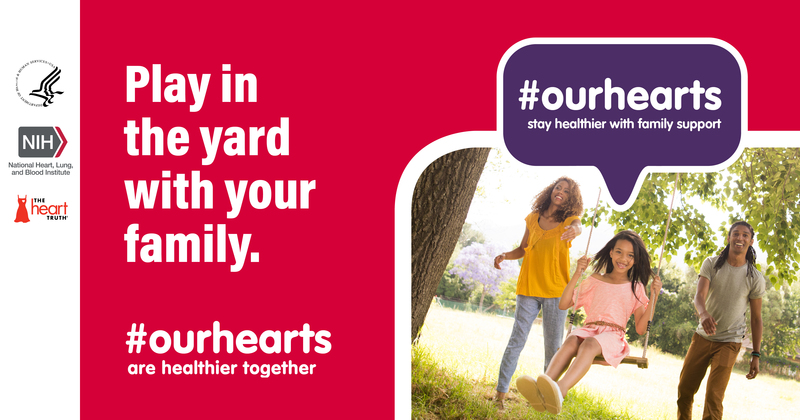 For American Heart Month, we want to hear what you do at home with your family to stay heart healthy! 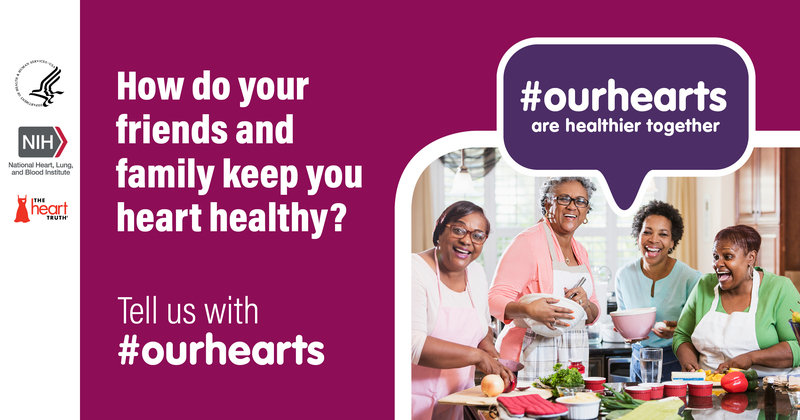 Share your words of wisdom on social media using #OurHearts. 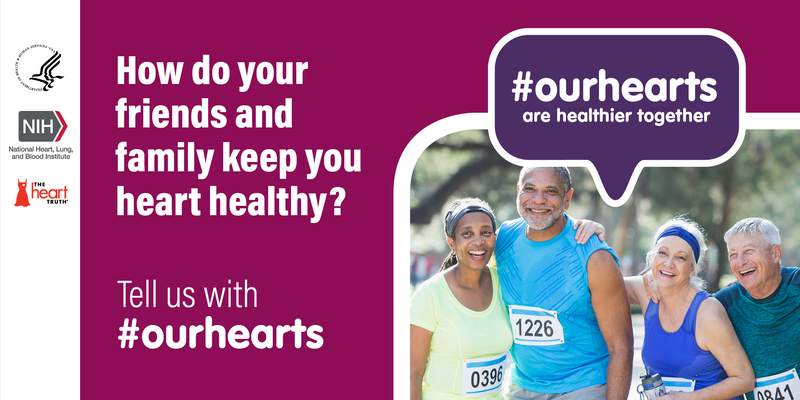 Did you know African Americans and Hispanics continue to have higher rates of certain risk factors for heart disease than their non-Hispanic white counterparts? 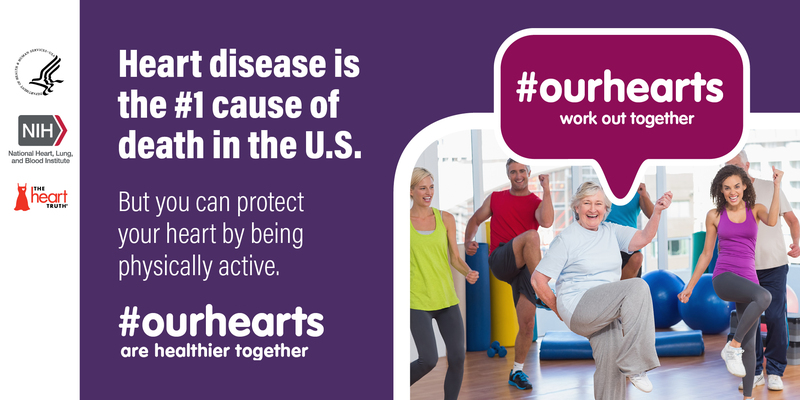 That’s why we’re supporting the National Heart, Lung, and Blood Institute and The Heart Truth® during American Heart Month to spread the word that #OurHearts are healthier together. 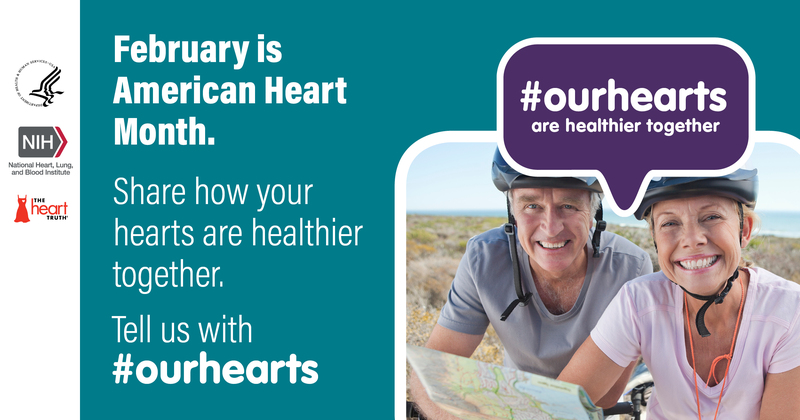 Visit www.nhlbi.nih.gov/heartmonth for educational resources to promote the importance of heart healthy behaviors and lifestyle changes, including fact sheets, social media resources, flyers, and more. 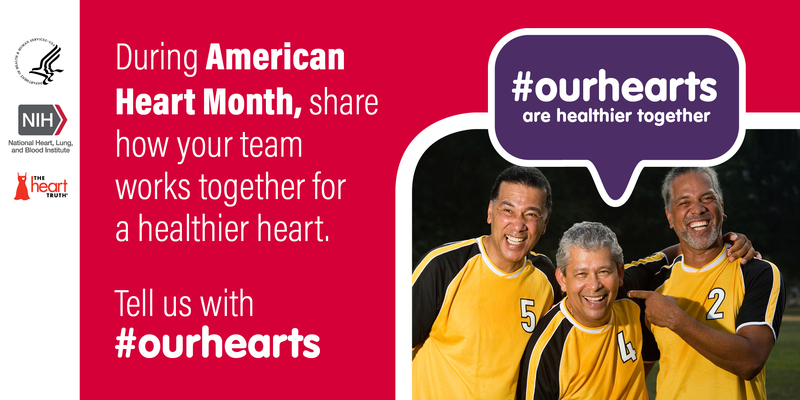 Did you know Hispanics continue to have higher rates of certain risk factors for heart disease than their non-Hispanic white counterparts? 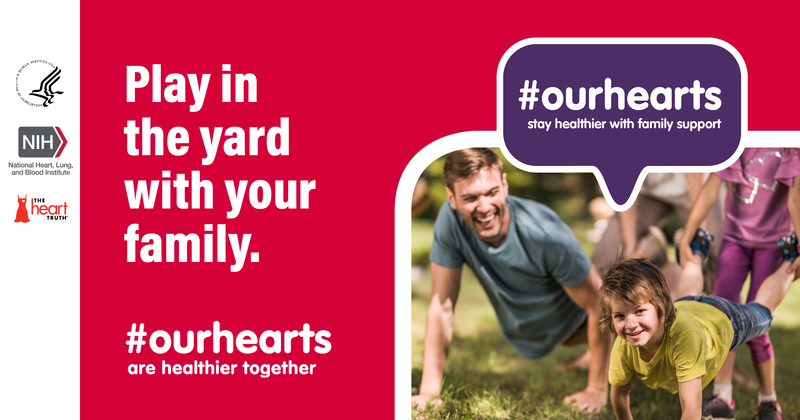 That’s why we’re supporting the National Heart, Lung, and Blood Institute and The Heart Truth® during American Heart Month to spread the word that #OurHearts are healthier together. 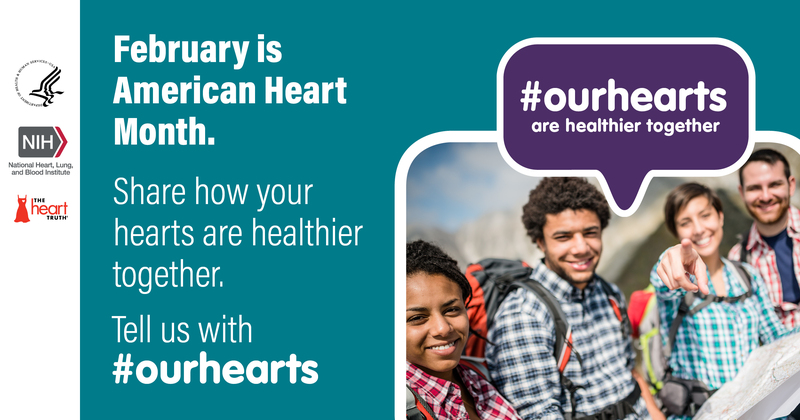 Visit www.nhlbi.nih.gov/heartmonth for educational resources to promote the importance of heart healthy behaviors and lifestyle changes, including fact sheets, social media resources, flyers, and more. 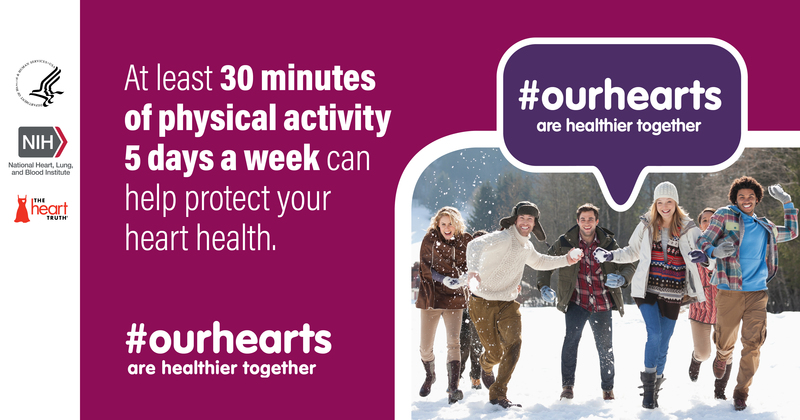 The majority of Hispanic adults do not meet the recommended amount of weekly aerobic or muscle strengthening activity. 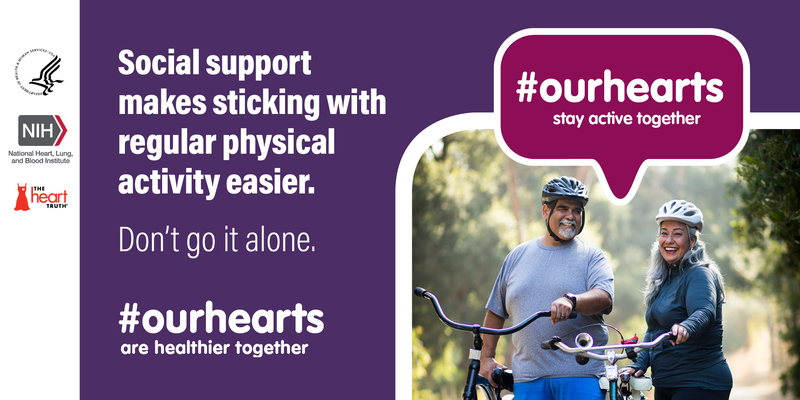 Research has shown that having social support and personal networks makes getting regular physical activity, eating healthy, losing weight, and quitting smoking easier. 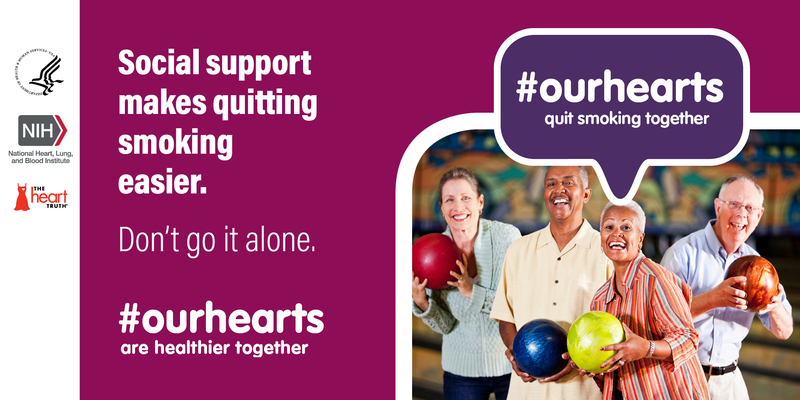 Don’t go it alone. 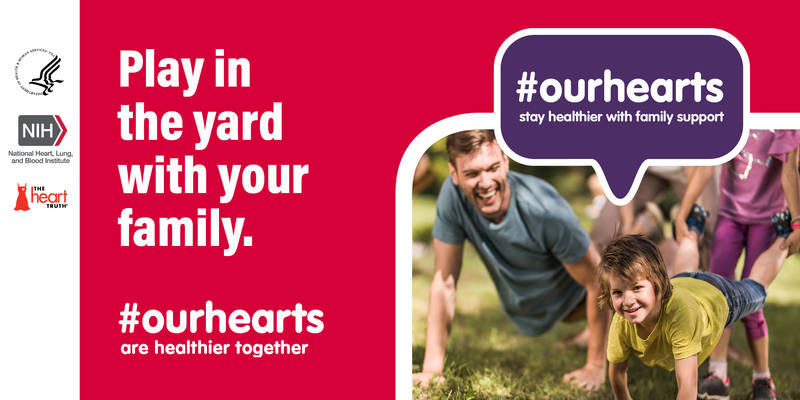 During American Heart Month, join a team, find your squad, or gather your family to #MoveWithHeart and show how #OurHearts are healthier together! 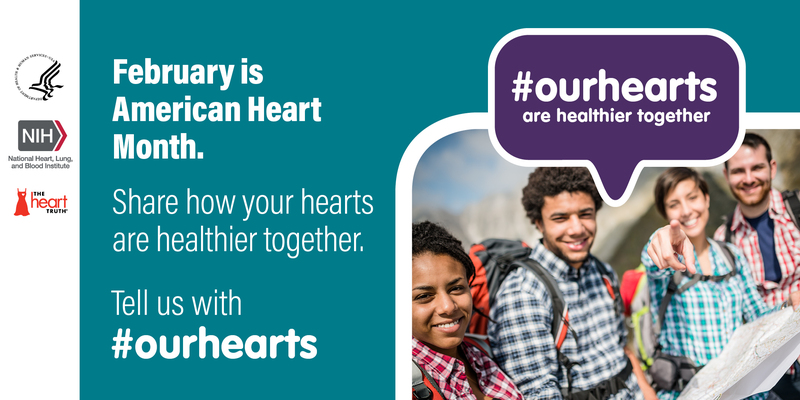 ¿Sabía que los Hispanos continúan teniendo una tasa más alta en ciertos factores de riesgo de enfermedades del corazón que las personas blancas y no Hispanas? 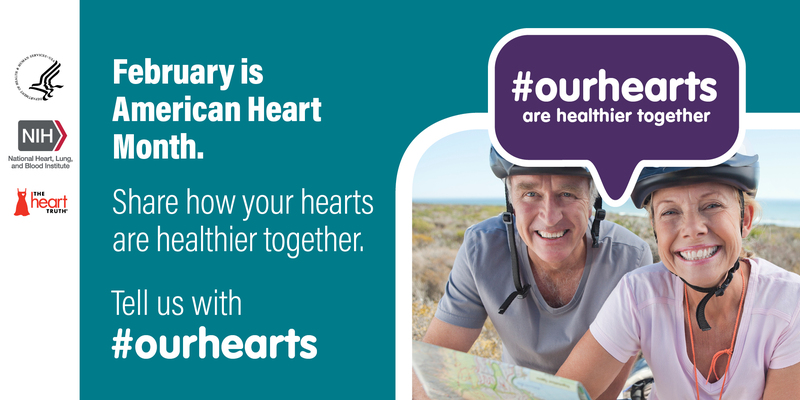 Es por eso que estamos apoyando al Instituto Nacional del Corazón, los Pulmones y la Sangre y The Heart Truth® durante el Mes Nacional Del Corazón para difundir el mensaje de que #NuestrosCorazones son más sanos juntos. 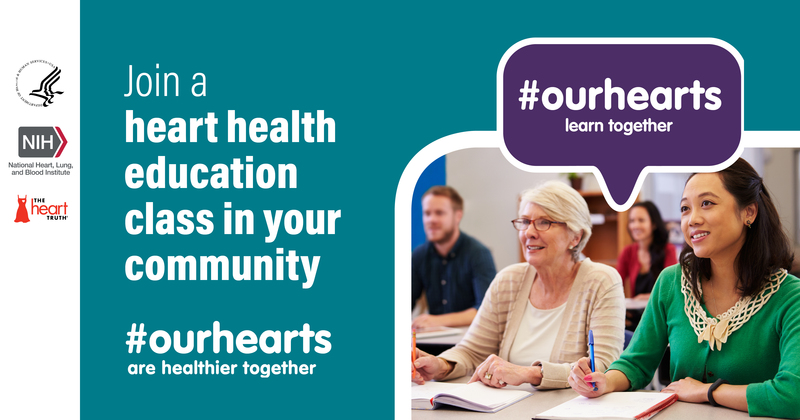 Visite www.nhlbi.nih.gov/heartmonth para recursos educativos que promueven la importancia de comportamientos saludables para el corazón y cambios en el estilo de vida, incluyendo hojas informativas, contenido para redes sociales, folletos y más. 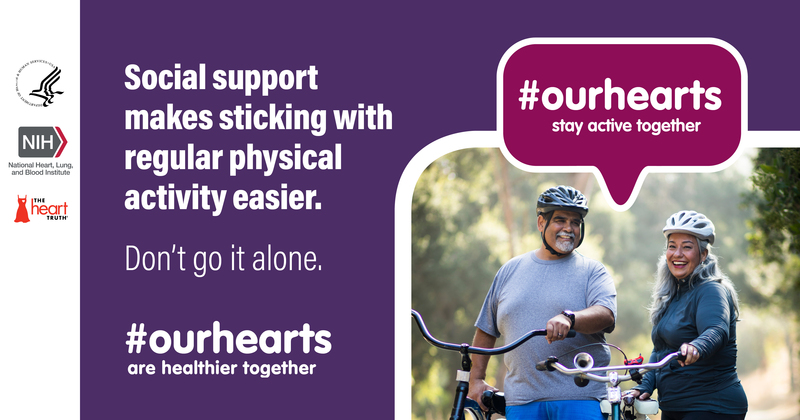 La mayoría de adultos Hispanos no hacen la cantidad recomendada de ejercicio aeróbico o fortalecimiento muscular por semana. Estudios de investigación dicen que tener un sistema de apoyo social y personal hace que sea más fácil ejercitarse regularmente, comer saludable, bajar de peso y dejar de fumar. No lo haga solo. 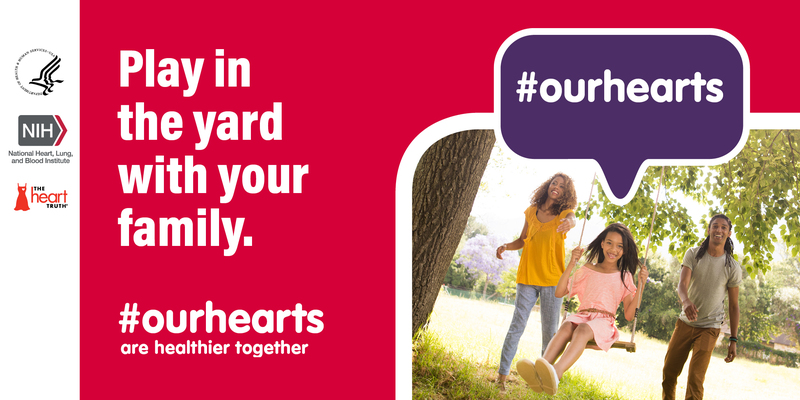 Durante el Mes Nacional del Corazón, únase a un equipo, encuentre su escuadrón, o junte a su familia para #MuévaseConCorazón y mostrar que #NuestrosCorazones son más sanos juntos!